Coburn says Flyers have continued to pay attention to detail throughout the 2010 playoffs and have now reached the Stanley Cup Finals. When the most troubling issue you face after two rounds of the NHL Playoffs is a lackluster-looking post-season beard, things can't be too bad. Fortunately for Coburn and his teammates, the Flyers have certainly been looking good since the playoffs got underway. After a tough stretch to end the regular season, Philadelphia drew the New Jersey Devils in the first round. They sent their rivals packing in five games before their unbelievable seven-game win over Boston in the semifinals. Down 3-0 in the series and behind 3-0 in Game 7 against the Bruins, Philadelphia, who has lost a host of players to various injuries, became the third team in NHL history to capture a series after losing the first three games. The only other teams to win a series after being down 3-0 were the 1942 Toronto Maple Leafs and the 1975 New York Islanders. The other 159 teams that took the first three games in a series all won. “After we lost the first three games, we really tried to stay focused on the next game,” said Coburn, who played major junior hockey with the Portland Winter Hawks of the Western Hockey League (WHL) where he was awarded the Jim Piggott Memorial Trophy as rookie of the year for the 2001–02 season. “There was no panic, no one getting to low when we lost and no one getting too high when we started getting back into the series. Was that still the prevailing feeling when the Flyers found themselves down three goals as the visitor in the deciding game against the Bruins? Still, Coburn admits it would be nice to escape the drama that has been Philadelphia's calling card in the 2009-10 post-season. But it's also comforting to know they have a penchant for engineering seemingly impossible comebacks. It's something that Flyers' fans have picked up on as Philadelphia attempt to win their third Cup and first since 1975. For his part, Coburn, who has just 30 over games of playoff experience at the NHL level, isn't going to try and radically redesign his approach against the Canadiens. And who knows? Perhaps Coburn can figure out a way to get his beard in game shape sooner rather than later. 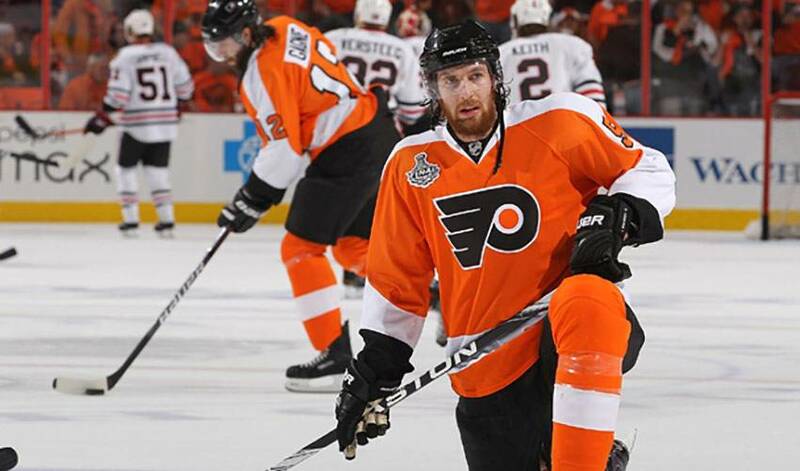 The Flyers' playoff appearance, however, is better than Coburn could have ever asked for.